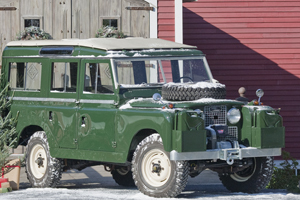 ORVIS IS AUCTIONING OFF THIS 1959 LAND ROVER SERIES II MODEL 109. RESTORED BY LANNY CLARK IN VERMONT. THIS PARTICULAR VEHICLE WAS DRIVEN TO THE WORLD'S FAIR IN SEATTLE IN 1962 AND THEN RETURNED TO THE EAST COAST VIA ALASKA AND CANADA. LANNY GOT HIS HANDS ON THIS BEAUTY IN 2001 AND IT NOW CAN BE YOURS. GOOD LUCK AND HAPPY BIDDING.